Hello again from your online Thai supermarket. 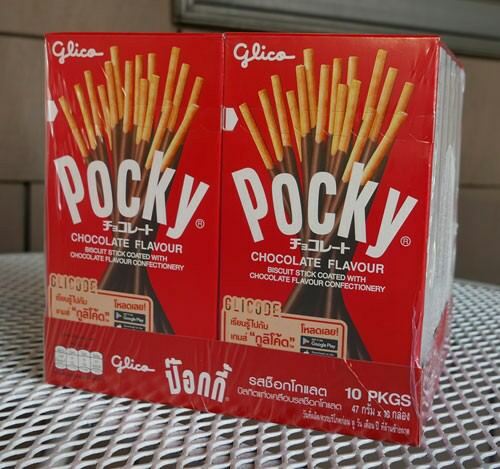 This is the first time we can offer Thai Pocky, both chocolate and strawberry just arrived. Also new flour from Kruathip and Snow Rice Crackers from Bin Bin. Pocky made in Thailand is a rare treat. We have a few cases to offer, just arrived from Thailand. Fresh pack and ready for you to enjoy at a very low price for our newsletter readers. We also have Strawberry Pocky just arrived. Check out the great price. Made in Thailand. Bin Bin brand from Thailand's large round crackers made of rice flour coated with a sweet frosting. National Public Radio (NPR) just did a story about Shark, describing authentic sauce from the Sriracha region is the real thing rather than the overly spicy California version of the same name. We've been selling cases of it the last week -- just wanted to let you know.